The first offshore wind energy system in the United States is expected to begin operation in the coming days. The wind farm is located off the coast of Rhode Island and Deepwater Wind is behind the development of this project. Before it can begin feeding electricity into the energy grid, however, the project faces one last hurdle: It must win the approval of New England’s energy regulators. If approval is granted, the electricity that the offshore wind energy system generates will be funneled into the region’s infrastructure. The Block Island Wind Farm is the first commercial offshore wind energy system to be built in the United States. There are other similar projects being developed, but they have yet to reach a point where they can begin generating electricity. Offshore wind projects have been gaining popularity due to their ability to produce large amounts of energy. This is largely due to the strong wind currents that can be found at sea. These wind currents are not affected by geographic barriers, such as mountains or buildings, so winds tend to blow with more force offshore. While offshore wind energy has been attracting support, it still faces many challenges, both logistically and politically. Offshore projects are often quite expensive, making them unfavorable to investors and developers. There are also environmental concerns regarding offshore wind turbines, such as how their installation will affect the local environment. Politically, federal lawmakers have shown support for wind energy in general through the Production Tax Credit, which provides financial support for various projects. 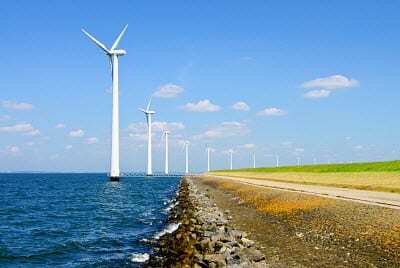 With major changes coming to the federal government, however, the support for offshore wind energy may lose momentum. The new offshore wind energy system could help the United States accomplish its ambitious environmental goals, specifically the reduction of emissions production. Earlier this year, the Obama administration announced plans to support the construction of offshore wind energy systems throughout the country, increasing installed wind energy capacity by 2050. The goal is to have these energy systems produce enough electricity to power more than 23 million average homes.